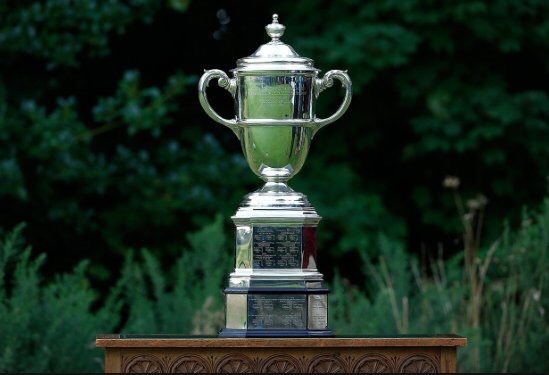 The Walker Cup is a two day golf match played between 10 man teams of amateur golfers from Great Britain and Ireland (GB&I) and the United States of America (USA). On both days there are four foursome matches in the morning followed by a series of singles in the afternoon; eight on Day 1 and ten on Day 2. The respective Team Captain’s submit their foursomes and singles line ups together the night before each day’s play. GB&I traditionally have an advantage in the foursomes, a format that is played far more often on this side of the Atlantic than in the USA. As there is a total of 26 points available a team must secure at least 13.5 points to win the match outright. The team holding the cup can retain it by winning 13 points. 2009 – Ten singles were introduced on Day 2, therefore ensuring every team member has to play. This was the first format change in 46 years. 1971 – Half points for halved games started to be awarded. Previously halved games were ignored but following the move to 18 holes in 1963 they inevitably became more frequent. Here is a list of the number of halved games prior to 1971: 1923 – 1, 1926 – 1, 1932 – 3, 1934 -1, 1936 – 3, 1938 – 1, 1951 – 3, 1957 – 1, 1963 – 4, 1965 – 2, 1967 – 4, 1969 – 6. 1963 – All games were reduced to 18 holes allowing 4 foursomes and 8 singles to be played on both competition days. 1922 – The original format consisted of 4 foursomes on Day 1 and 8 singles on Day 2. All games being played over 36 holes with points only being awarded for outright victories.